EXCLUSIVE — A Gulf Power document first obtained by NorthEscambia.com shows the company is analyzing the feasibility of a proposed natural gas pipeline though North Escambia to convert Plant Crist from coal to natural gas. “An underground natural gas pipeline to Plant Crist would give it the capability to run completely on natural gas,” the power company document states. The proposed natural gas pipeline will run about 39 miles from the existing Florida Gas Transmission Pipeline near the Florida/Alabama border outside Century south through McDavid, Molino and Cantonment to Plant Crist on Pate Street just northwest of the University of West Florida. Over 85 percent of the proposed route would be located on existing corridors like Gulf Power transmission line corridors. A project timeline shows permitting beginning by May of this year, construction beginning in early 2020 and the pipeline in service by mid 2020. “Gulf Power is conducting land surveying to determine the best, most appropriate route for the pipeline. The pipeline will undergo a comprehensive review by numerous local, state and federal agencies to ensure it complies with all environmental and regulatory standards,” the document states. 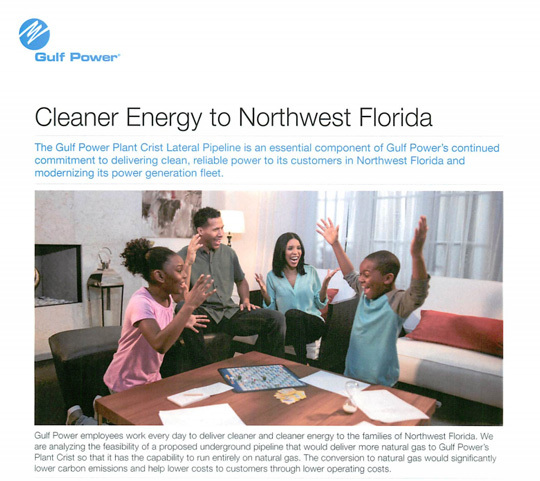 The Gulf Power document indicates the conversion of Plant Crist to natural gas would mean cleaner energy and projected lower bills for customers. It is estimated the project would create 375 “good-paying” jobs at peak construction and $37 million in tax revenue for Escambia Count during the 35-year operating life of the pipeline. 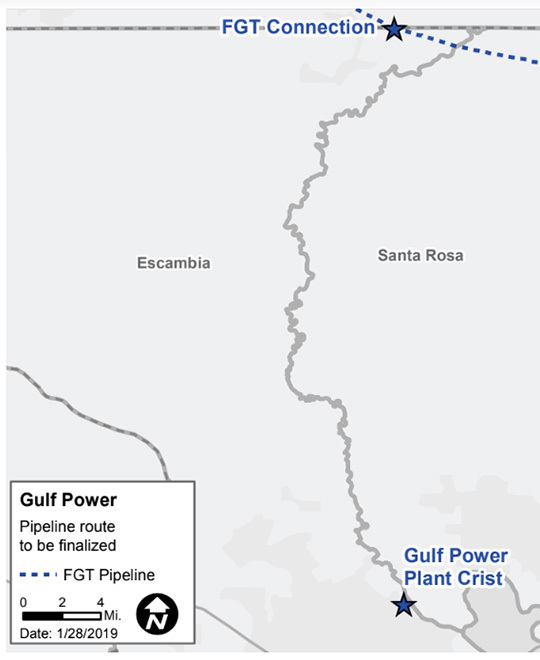 Pictured: Images from a Gulf Power document relating to a natural gas pipeline through North Escambia for the conversion of Plant Crist to natural gas. NorthEscambia.com images, click to enlarge. Not because of anything any liberals are doing. It’s cheaper and cleaner, bottom line. Those coal mining jobs aren’t coming back, no matter what anyone tells you. Neither are those high-paying union assembly line jobs that robots are now doing. The problem lies in thinking it was supposed to scrub carbon dioxide. The name “flue gas desulfurization project” should suggest the real goal. Understand that using natural gas should remove all of those and reduce carbon dioxide emissions around 50%. This is not your old Gulf Power any longer. It is FP&L. Affectionately called Florida Plunder and Loot by we native South Floridians. I’m smart enough to know if Gulf Power thinks it will save money, they know more than it than I do about it. Likely more to this story. We need transparency about the use planned for 5000 acres GPCO purchased in North Escambia. Natural Gas pipeline might just have a connection. @MR REALITY—Did you really mean $500 MILLION, (Half a Billion dollars) with that many zeroes? At Cantonment; Apparently you did not receive a letter that the land owners along the proposed route received. It stated that they could use eminent domain if the owner was opposed to them using their land. Yes it will be run along existing right of ways but that does not mean they will not take more property from the owners to run the line. Most of the existing right of ways that the power company runs their power on, already has other underground utilities buried beneath the power lines. The pipeline will not be run directly under the power distribution lines but will be along side them. This will encroach even more on the private property of the land owners, which will result in lower property values, and in my case, less land to grow trees on. So while G.P can declare eminent domain and take property from individuals so they can increase their profit margins the individual property owners will suffer the loss, and continue to pay taxes on the property that is being used by the power company. And don’t think the consumer will see a reduction in their power bill, this is for the bottom line and their profit. If 85% of the route runs through existing corridors, I have no problem with it. People seem to ignore the fact that it’s going to be running through existing property. They can’t use eminent domain either, so they’ll have to either purchase the land or use public lands for it. I want one of the old Century meters also. I am with Phil also nuclear power, they already bought the land. cost saving and less emissions this is a no brainer.. Wait how much did we pay for the carbon scrubber system…$500,000,000…UNREAL!!! There should be some accountabulity!! !